A herbaceous perennial named for its enormous, heart-shaped leaves, elephant ear (Colocasia esculenta) is a statement ornamental plant in water gardens and indoor poolside features. This tropical native, also known as elephant ears, elephant's ear and taro, is hardy in the warm, wet climates of U.S. Department of Agriculture plant hardiness zones 8 through 11 and can reach up to 8 feet in height under perfect conditions. Also a reliable food source, elephant ear produces edible roots in thick, tuberous clumps that are ideal for propagation by division. 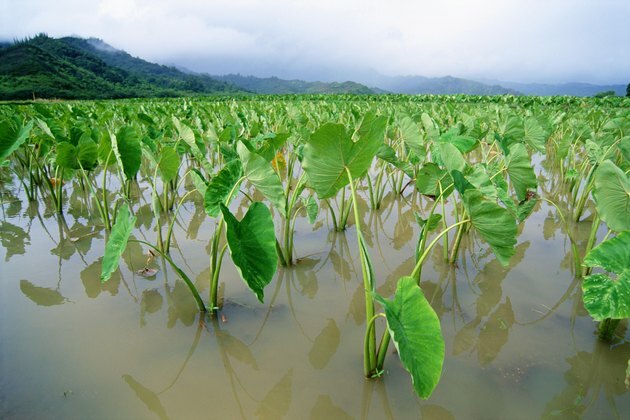 Wetland elephant ear prefers waterlogged soil while moist soil supports upland varieties. Put on waterproof gloves to prevent elephant ear's mildly irritating sap from touching your skin. Expose the plant's roots carefully by digging into the soil 8 to 12 inches from the plant's base. Loosen the soil around the plant by hand. Pull the plant's roots apart by hand. Separate tubers, which look like slender, ridged potatoes, and their associated roots from the main plant by using a sharp knife. Ensure each tuber retains at least one bud. A bud is a small sprout on a tuber. Select a planting location with well-drained soil in partial shade. Dig one hole 2 to 3 inches deep for each tuber. Space the holes 2 feet apart in rows 4 feet apart. Place one tuber in each hole with a bud facing upward. If a bud is not readily recognizable on a tuber, then plant the tuber horizontally. Add 1 teaspoon of a slow-release, high-phosphorus fertilizer to each hole. Fill the remainder of each hole with the soil you removed to create the hole. Apply a 2- to 3-inch layer of mulch on top on the soil covering the tubers. Water the site well. Keep the soil moist, but not soaking wet, throughout the growing season. Repeat the application of 1 teaspoon of slow-release, high-phosphorus fertilizer once each month, placing the fertilizer on top of each tuber's soil. Water deeply after fertilizing. Harvest the tubers from the plants after six to eight months.